The Druid's Herbal: Module 3 – Option 3Herb Lab ~ Results for the first two herbs in my herb kit. Herb Lab ~ Results for the first two herbs in my herb kit. 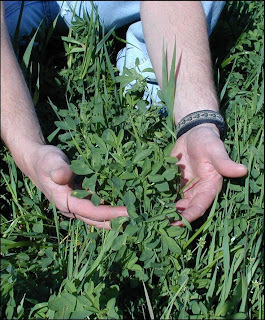 Common Name: Alfalfa, also called California Clover or Spanish Clover. Appearance: Bright green and leaves are very bushy and full with clover like yellow to violet-blue flowers. Texture: When it is dried it is very brittle. Crumbles easily in your hands. Taste: I agree with the class consensus, it taste like grass to me. I haven't had a chance to try fresh alfalfa yet so I don't know if it taste different yet. According to my PDR for Herbal Medicine and the Module 3's Alfalfa monograph, alfalfa is high in vitamins and minerals, vitamins A & C, Folic Acid (vitamin B9), Niacin (vitamin B3), Riboflavin (vitamin B2), and minerals Calcium, Iron, Magnesium and Potassium. Common Name: Catnip, also known as Catmint and Field Balm. Appearance: A leafy plant with ridged tear drop shape leaves (They don't look heart shape to me), are green to a grayish green. The flowers are small with slightly curled petals. Are white with purple spots on them. 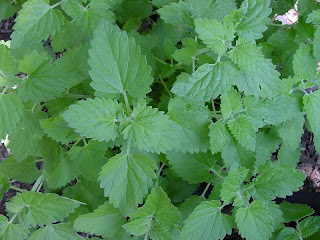 Texture: Like alfalfa, catnip is brittle and crumbles easily in ones hand. Scent: Maybe I still have the Alfalfa mixed with Mint tea from the day before stuck in my head. But I asked a friend to smell it without telling him what it was and he agreed with me. It smells like a minty hay. Taste: When I chewed some raw, I can taste the mint, but also I don't know how to describe it. It has a dry powdery taste, or would that be a texture. No it definetly has a powdery taste to it if that makes sense. Tea: Again I boiled water over a campfire in my camp coffee pot and used a bandana to steep the catnip for about 15 to 20 minutes. Definitely a minty taste but with a slight bitter after taste that I didn't much care for. Catnip has a long history in folk medicine in the treatment of colds, colic and fevers. It was also used to calm ones nerves and soothe migraines.